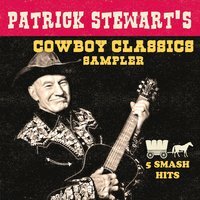 This sampler EP has 5 Smash singles selected by cowboy Pat himself. CD IN STOCK! Order today! Buy Em' by the dozen! All Proceeds go to IRC, International refugee and rescue support. Sir Pat's take on these timeless Cowboy songs from the American west will show you why he is considered England's top Cowboy singer! Once cowboy Pat sings a song, it is eternally his. The singing and song choices are top notch. We are buying multiple copies to enjoy and give as gifts. For a Royal Shakespearean actor from England who has trekked to the stars, fought magnetic mutants, and talked bluntly, Patrick Stewart makes quite the convincing country crooner. Unlike his equally musically inclined intergalactic predecessor, Stewart actually sings these cowboy classics (with the exception of “Ringo,” and to great effect). And he does a pretty fine job of it. It certainly helps that Stewart is backed by a top-notch band of musicians, including Ethan Eubanks (drums/percussion/vocals), Andrew Sherman (piano/accordion/vocals), Jim Campilongo (guitars), Jon Graboff (pedal steel/guitars/vocals), and Jeff Hill (bass). If you like country (and Christmas) music and Patrick Stewart, you’re in for a real treat. What could have easily been an exercise in pure hokeyness (not altogether a bad thing in itself) manages to be both kitschy and classy thanks to Stewart’s talents and penchant for having a grand old time. I do reckon there’s a future for Patrick Stewart in them there musical hills.